1975 – Born in Cypress, California on December 30th. Woods' first name – Eldrick – was coined by his mother because it began with 'E' (for Earl) and ended with 'K' (for Kultida). His middle name Tont is a traditional Thai name. He was nicknamed Tiger in honor of his father's friend Col. Vuong Dang Phong, who had also been known as Tiger. 1978 – Tiger appears on TV aged three and has a putting competition with Bob Hope. He also shoots 48 over nine holes at the Navy Course. 1983 – Breaks 80 for the first time, aged eight. 1986 – Beats his dad Earl (a single figure player) for the first time. Earl would never beat him again. 1988 – Meets Jack Nicklaus for the first time at a Bel-Air clinic Nicklaus was putting on. Nicklaus is impressed. He is also impressed by the fact that Earl has detailed all of Jack's achievents in the game and set Tiger the task of one day breaking those records. 1991 – Becomes the youngest ever winner of the U.S. Junior Amateur Championship, aged 15. 1992 – Becomes first player to successfully defend U.S. Junior Amateur Championship. 1993 – Becomes the only player to date to win U.S. Junior Amateur Championship three years in a row. 1994 – Becomes youngest player to win the U.S. Amateur Championship at Sawgrass. 1994 – Plays golf with GolfPunk's editor at the Navy Golf Course, Cypress, California. Tiger is not unduly troubled by the competition. Informs GolfPunk's Editor that he intends to become "The best golfer in the world. And not just the best black golfer." 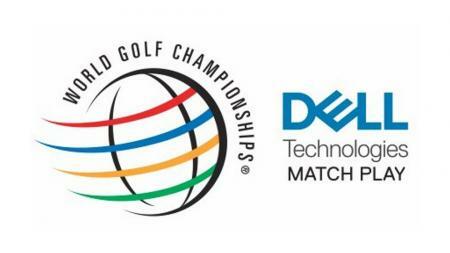 He enrolls at Stanford University in the Autumn and wins his first college tournament. 1995 – Plays the Masters as an amateur and makes the cut, finishing 41st. 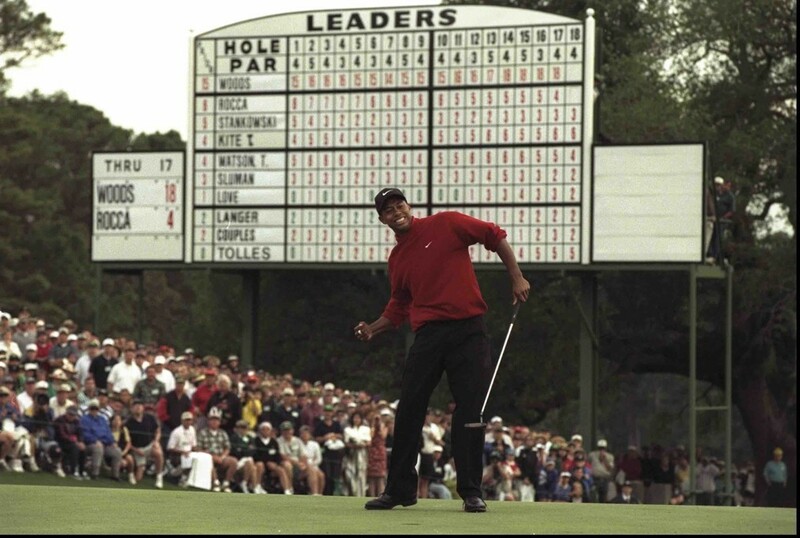 1996 – Becomes the first golfer to win three consecutive U.S. Amateur Championships. Wins the Silver medal at The Open with a record-equalling amateur score of 281 at Royal Lytham & St Annes. Just after his 21st birthday, signs multi-million dollar endorsement deals with Nike, General Motors, American Express, Accenture and Titleist. 1997 – Wins the Masters by 12 shots to become the youngest player to win at Augusta National and the youngest major winner since World War Two. 2000 – Becomes the fifth player in history to complete the career Grand Slam of the Open, US Open, U.S. PGA and Masters. Signs 5-year contract extension with Nike worth $105m, the largest sport star endorsement in history. 2001 – Wins the Masters again and completes the 'Tiger Slam', becoming the first golfer to hold all four majors simultaneously. 2002 – Wins back-to-back Masters, joining Jack Nicklaus (1965-66) and Nick Faldo (1989-90) in winning the Masters in consecutive years. 2003 – Marries Jesper Parnevik's nanny, Elin Nordegren. 2004 – GolfPunk launches and GP's editor doorsteps Tiger at Isleworth to show him the dummy issue for the magazine. "Tell him it's the guy who he played golf with when no one had heard of him when he was 17," we said. "Tiger is not home," Is what the security man said. 2005 – Causes the sporting world to go berserk with the miracle chip in at the 16th at Augusta. Wins his fourth green jacket by seeing off Chris DiMarco in a play-off. 2006 – May 3rd. His father and mentor Earl dies aged 74. In July, Tiger win his third Open championship and 11th major title at Hoylake. 2008 – Somehow drags his injured knee around Torrey Pines for four days and is victorious at the U.S. Open, eventually winning a play off with Rocco Mediate. 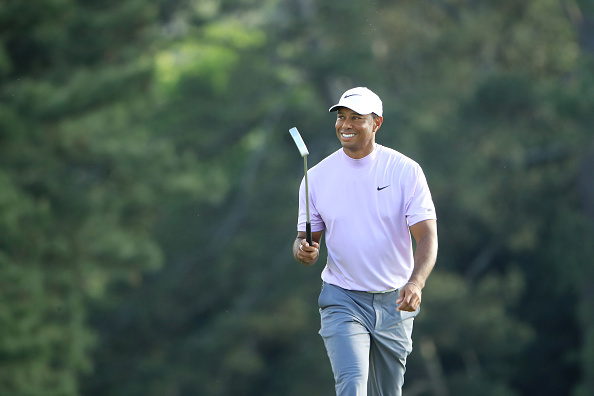 It is Tiger's 14th major win but turns out to be the last for 11 years. 2009 – Is found bleeding and semi-conscious in his car after being chased form his house by a 3-iron wielding Erin, his car hitting a tree and fire hydrant outside his Florida home at Isleworth. He later apologises for letting his family down over a series of extra marital affarirs. Mostly with cocktail waitresses. 2010 – He and Elin divorce, ending a seven-year marriage. 2013 – No majors but he does win The Players Championship, one of six victories on the PGA Tour this year. 2014 – Has the first of what would be our back operations over the next four years. 2015 – Misses the cut at U.S. Open, The Open and U.S. PGA. 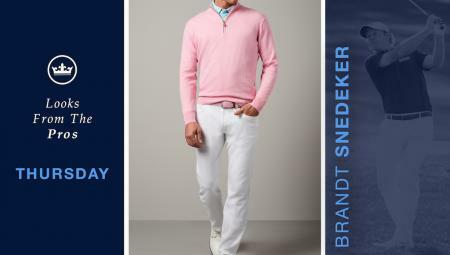 Plays 11 times on the PGA Tour, with a best finish of 10th at Wyndham Championship in August. Does not play again this year. 2016 – Registers for U.S. Open at Oakmont and then withdraw with injury. Does not play again this year. 2017 – Misses the cut at The Farmers Insurance, his first PGA Tour event in almost 18 months. Is 1,199th in the world rankings. He is also charged with driving under the influence after being discovered asleep at the wheel of his car with the engine running. 2018 – Briefly leads The Open at Carnoustie on Sunday, eventually finishing 5th. Records a runner-up spot at the US PGA Championship. Causes emotional scenes at East Lake as he wins for the first time in five years at the Tour Championship. 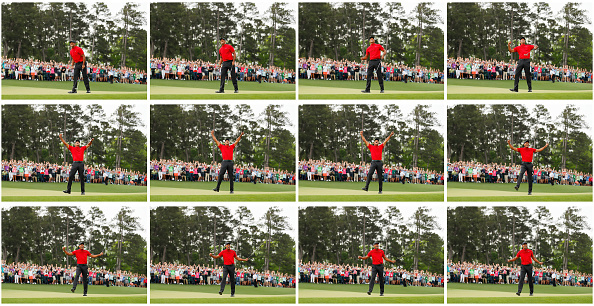 2019 – Makes everyone cry by winning the Masters to complete one of sport's greatest comebacks. Is now ranked 6th in the world.